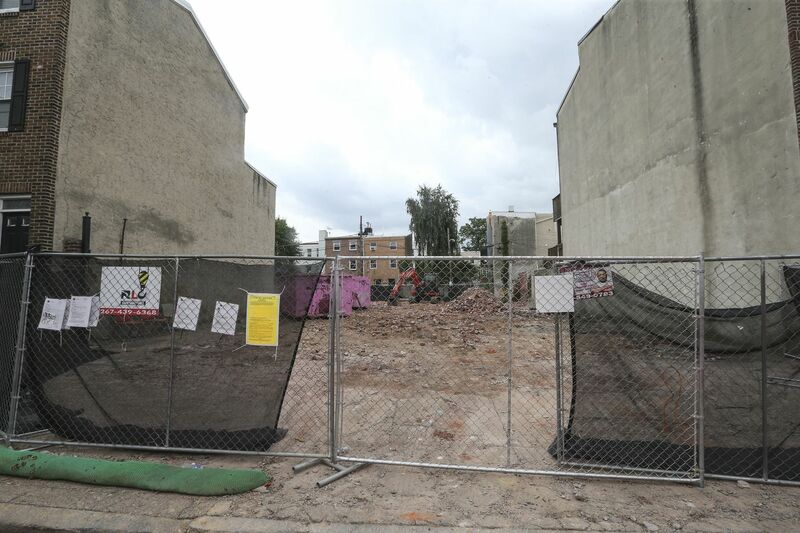 The site of the former Christian Street Baptist Church in Philadelphia's Bella Vista neighborhood. Philadelphia's Zoning Board of Adjustment approved variances on Wednesday for the former Christian Street Baptist Church site, allowing the new owner of the Bella Vista lot to build six townhouses where the 1890s church stood. The vote means MRR Investments Inc. — the property's new owner — can proceed with developing 1020-24 Christian St. The company purchased the former church site on July 26 for $1.5 million after developer Ori Feibush transferred his agreement of sale with the church. Still, even after it was sold, it was Feibush who applied for zoning approval in August. Asked why, he said Thursday that he wanted to follow through on plans he had revised, based on feedback from nearby neighbors. "The new owner gave me his blessing to see the project through to zoning," Feibush said. "If he lost at [the ZBA], he was going to build" a project compliant with current zoning, which allows for attached and semidetached homes. "I, along with many near neighbors on Salter (Street), saw that as a disappointing outcome, and we worked together to try and get the plans we had designed together approved," he said. According to Feibush's revised plans, two of the six townhouses — all of which will be 38 feet tall — will be on Christian Street, with the remaining four on Salter Street, a narrower road directly to the south. Each is designed to have a roof deck, pilot house, and parking garage, with a shared driveway between the homes. A curb cut on Christian Street will allow car access. Feibush said he also worked with neighbors to design the homes' exteriors. The approved plans are slightly less dense than the seven homes Feibush proposed in May and move the car access off of Salter. Even so, many neighbors remained opposed earlier this month. MRR Investments Inc. was incorporated in December by Margarita Yakubova, a Philadelphian, records show. Many of her real estate deals have been done in partnership with Reuvan Mosheyev, a Philadelphia developer. Reached by phone last week, Mosheyev, who also goes by the name Roman, said he had a "connection" to the site but did not elaborate. Feibush said he would have no more involvement with the project.